Sets of photographic stamps featuring the South Korean TV drama "A Jewel in the Palace," which is being currently aired on NHK to popular reviews, will be released in Japan on Apr. 28. Each set consists of ten 80-yen stamps. 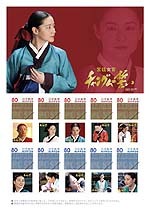 The first set features ten different kinds of photographs of Lee, while the other set showcases the photographs of other actors in the drama, including actor Lim Ho, who played King Jungjong (the 11th king of the Joseon Dynasty). The sets of stamps will be released almost concurrently with Lee's pending visit to Japan. She is expected to appear on NHK's live program entitled "Live Show from Our Studio in a Park: How Are You?" on May 8 and hold a large-scale fan meeting. These sets of stamps are expected to reach great popularity, as "Girl Janggeum's Dream," an animation version of "A Jewel in the Palace," was recently aired on NHK as well.